← How to install Kali Linux in Virtualbox : Step-By-Step guide. 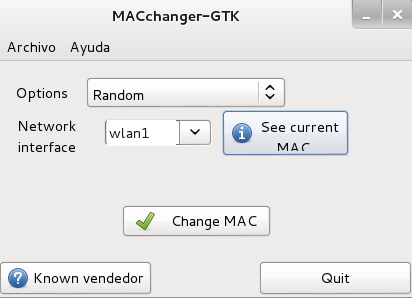 Hey, I tried changing my MAC using “macchanger -A wlan0” but when I try to connect to the Internet (“ifconfig wlan0 up” and then choosing a different network which I cancel and my system automatically connects to my current Wi-Fi network), the MAC address gets reverted back to the original MAC address. Why is that happening? Good question, let me do some research and see if I can get you an answer on why the MAC address is reverting back to the original. I am having a similar problem. I bring down eth0 before running macchanger. The address changes to a new one but after the change in address, I can’t bring eth0 up again. If I force a reconnection using the network box at the upper right hand icon on the page, the address reverts back to the original one. The point is that once I change my mac address, I can’t get back on the internet since eth0 is no longer working. Any ideas? Same problem here. Normally you would want to do a mac change before connecting to a network. But when you connect to a wifi mac reverts back to original. Tried literally everything. Macchanger, ifconfig hw ether, on 2 adapters. big fail..